Think having a manual transmission fitted to the new Porsche 911 GT3 will cost you extra? Think again. Porsche purists everywhere rejoiced when the German manufacturer revealed the new 911 GT3 at Geneva with one long-requested feature: a manual gearbox. With prices starting at $143,600, it’s something of a sports car bargain, too – at least compared to the extortionate 911 R, which often shows up at dealers with a $1 million price tag, bewilderingly. The standard 911 GT3 comes with a dual-clutch PDK transmission, but if you want an old-school manual setup, it’s available as an optional transmission instead. Purists will argue that nothing beats the satisfaction of a traditional H-pattern shifter. In case you're wondering how much Porsche is charging for the privilege, the news just keeps getting better. According to Car and Driver, Porsche won’t be charging any extra to have a manual six-speed transmission fitted to the new 911 GT3, though it’s worth noting that a stick-shift setup is usually a cheaper option than a dual-clutch transmission. Porsche even offers a discount on some 911 models if you opt for a manual, but that sadly isn’t the case with the new GT3. 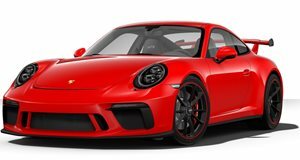 And while the manual option won’t bump up the price for the new GT3, the extensive array of optional extras Porsche is notorious for certainly will. Porsche GT chief Andreas Preuninger also told Car and Driver that he expects the manual 911 GT3 to take up 40 percent of worldwide sales. In the US, however, he predicts that the US market will be evenly split between the two transmissions. The transmission is mated to the Porsche 911 GT3’s new naturally-aspirated, 4.0 liter flat-six engine based on 911 race cars such as the 911 GT3 R and 911 RSR. It produces 500 horsepower and 338 lb-ft of torque, but those who opt for the manual transmission will suffer a slight performance decrease. The slower shifting of the manual means that 0-60 mph takes 3.8 seconds compared to 3.2 seconds for the dual-clutch 911 GT3. There is an upshot, though. Purists will be able to reach a higher top speed of 198 mph – that’s one mph faster than the dual-clutch model, if that’s the sort of thing that matters to you.